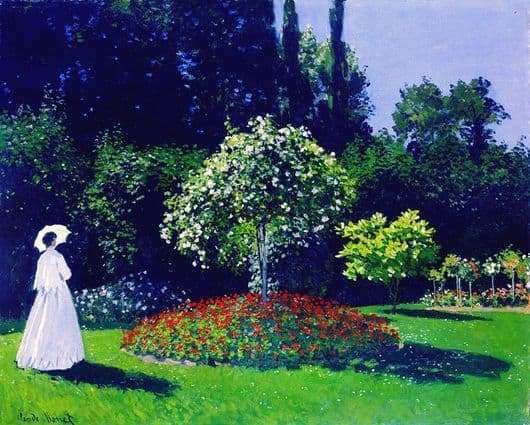 The full name of the painting – The Lady in the Garden of Saint-Adress, written by the famous French artist Claude Monet in 1867. The favorite theme for the artist’s work is the theme of nature, his landscapes are unique and always so vivid that the people depicted in them seem to want to merge with this nature, to be absorbed by its marvelous colors. The painting “The Lady in the Garden” was painted on the very peak of the artist’s career, therefore the image of a woman is so beautiful and intangible at the same time. In his later works, the artist completely refuses to depict people, giving the main role to nature. Summer hot day, the rays of the sun penetrate every leaf of the tree depicted in the foreground. Here is a strolling girl in a crystal white dress. The girl and the tree are located on the same level by the artist, which shows his desire to equate nature and man, to say that they are one and therefore both are beautiful. The girl admires the flower beds and turned half-turned towards the viewer, so that her face is not visible. And this is the correct nature of the faceless, it is in every blade of grass, and in every flower, as well as in a woman walking under an umbrella. Nature lives, she didn’t just freeze at the moment when she was placed on the canvas, she continued her life out of time, and everything also gives a reason to the girl and everyone who is interested in the artist’s art to see these changes. The picture glows with its every point, and the girl is so snow-white that it is comparable not with a man, but with a swan swimming along the thickets of bushes and trees. A huge park, high crowns of trees and a little girl who admires the surrounding landscape – all this is Monet himself, his soul, the soul of a true artist who can love and enjoy the world around.